Psoriatic Arthritis is a type of arthritis, which is mostly found in people with Psoriasis. Psoriasis is a chronic skin disease in which red, skinny, and itchy skin patches appear. About 6 to 42% of people with Psoriasis skin disease develop Psoriatic Arthritis. A person with Psoriatic Arthritis will be having inflammation in joints. Psoriatic Arthritis is mainly caused when body’s immune system attacks healthy cells and tissues. But, the exact cause of this change in immunity system is unknown. Symptoms of Psoriatic Arthritis that are commonly observed as stiffness, tenderness, swelling, and pain in joints, fatigue, lower back pain, pain in foot particularly in Achilles tendinitis and foot sole. Actually, there is no exact treatment for Psoriatic Arthritis. But, the available treatments concentrate on controlling the joint inflammation. 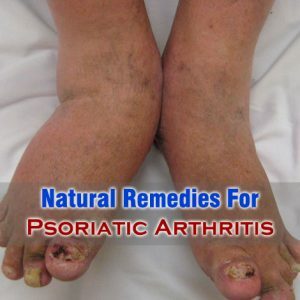 You can also take help of natural remedies for Psoriatic arthritis apart from using medications and surgeries. Cold press and heat press in reducing symptoms of psoriatic arthritis. Cold press helps in reducing joint inflammation, and heat press helps in reducing joint pain, and stiffness of joints. Excessive use of heat can result in blisters. To avoid blisters make sure to use a towel white between skin and heat press. Diet is one of the effective natural remedies for Psoriatic Arthritis. There are certain foods that a person with Psoriatic Arthritis should include in diet to ease the symptoms. Some of such foods salmon fish, whole grains, kale, spinach, broccoli, cereals, yogurt, etc. Exercise is another important thing that needs to be done for easing Psoriatic Arthritis symptoms. Exercising regularly helps in keeping the joints flexible and muscles strong. But, make that you do not follow stressful exercise. Instead, do light exercises such as walking, swimming, yoga, and cycling. Exercising regular will also helps in maintaining healthy weight. Maintaining healthy weight is essential for curing Psoriatic Arthritis symptoms. Psoriatic Arthritis patient can also take help of alternative therapies for treatment. Alternative treatments such as acupuncture, acupressure, and massage therapy have shown positive results in easing the symptoms. Taking proper rest is also for curing the symptoms of Psoriatic Arthritis. Try to take little relax several times in a day, and balance your daily activities. Taking rest is important, but it should not be too much. There is risk of developing more swelling and stiffness in joints with too much of rest.